If I can make these easy camping recipes, so can you! This is Mr Magpie here and if there is one thing Karlynn is incredibly good at, it’s coming up with delicious recipes and fun creations to enjoy when we’re out at our trailer. Whether it’s a delicious dessert or a mouth watering meal, there’s something for everyone in this list. Today, I’m going to share with you some of my favorite camping recipes she’s created. First, let’s start with the most popular camping recipes here on The Kitchen Magpie and work our way down the list! We have been updating this list as we add more and more camping recipes to the website. Fifteen Delicious, TESTED Camping Recipes! All of the following recipes are recipes that WE have eaten ourselves and then posted on the website. These are all tried, tested and true camping recipes for you to enjoy while out enjoying the great outdoors. Happy camping and cooking! 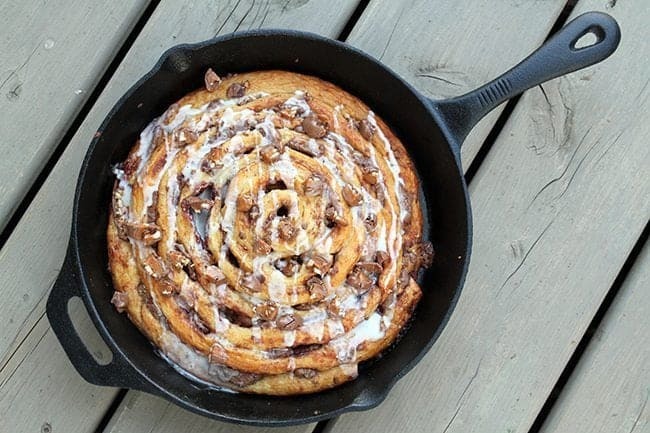 These pies went viral on Pinterest last summer and for good reason. You can’t even look at them without drooling! 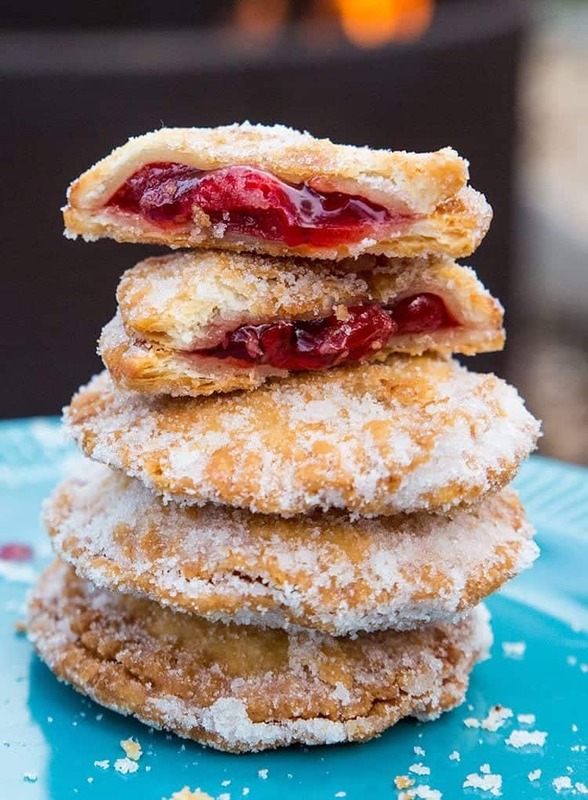 They are easy to make with canned pie crust and cherry pie filling! 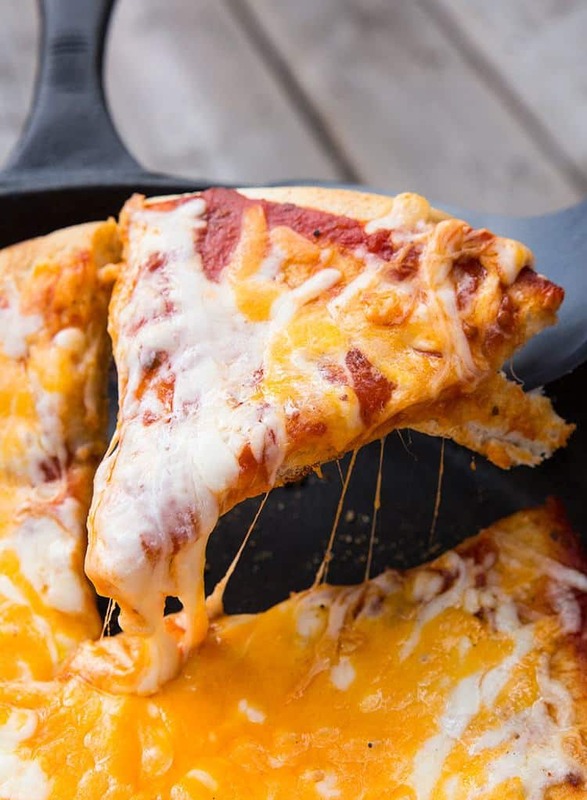 This campfire pizza keeps our little picky eater happy and is a treat as well! What’s great is that we can make it a plain cheese for her and then the rest of us get to put whatever toppings we want on it. 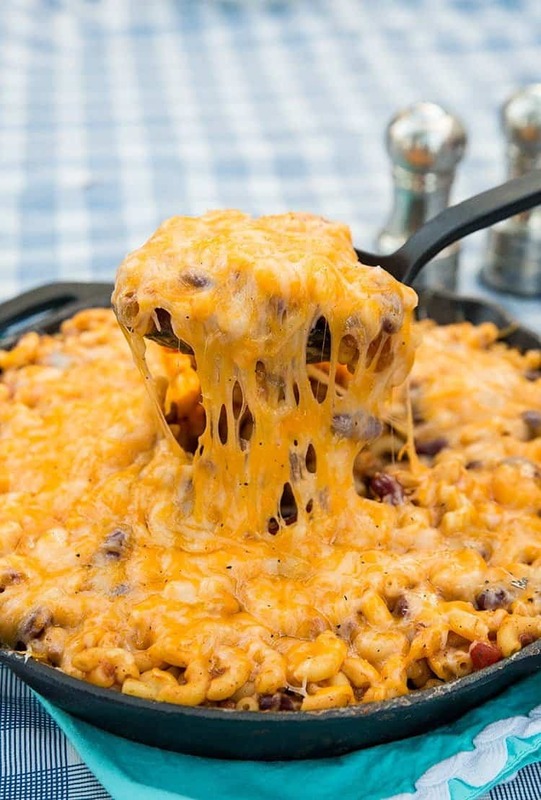 Pssst – make this chili mac skillet at home as well, don’t save it for camping!! This is one of my favourite meals that Karlynn makes while we are camping – and it’s easy enough for me to make it as well. Just look at that cheese! This is my favourite thing to eat while camping and I have taken over making it while we are out at the trailer. It’s like my Mom’s Calico beans, but with biscuits and easier to make! This is one of Karlynn’s most popular recipes and for obvious reasons; it’s easy to make, it tastes amazing and even our kids will eat it. Considering that our daughter is a picky eater, the fact that she’ll pretty much inhale these if we make them says a lot about how good they are. The best part? It’s incredibly quick and easy to make them. 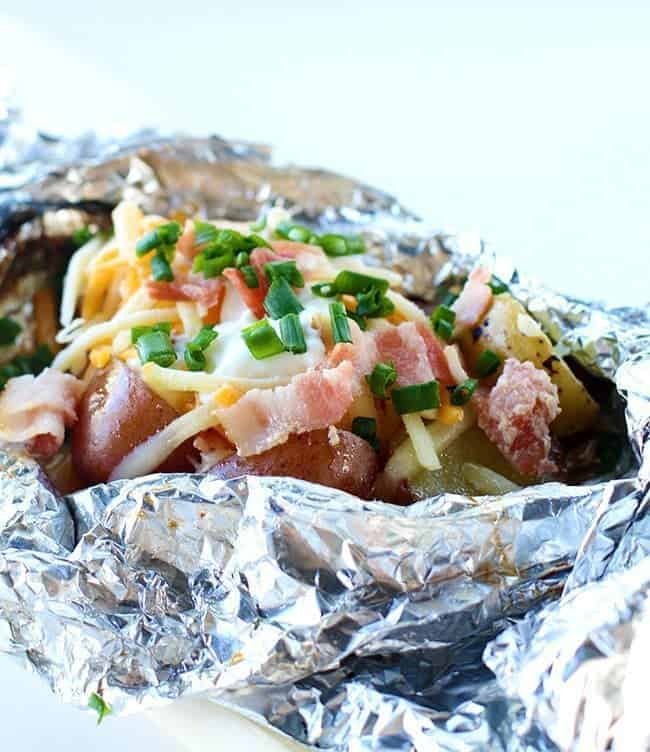 Who doesn’t love a good baked potato? 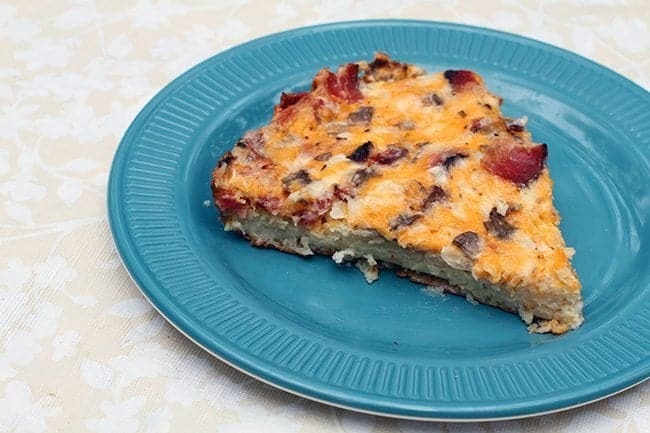 This is another super easy recipe to slap together while out at the campground and the best part? No dishes. You can eat it right out of the tinfoil packet (double points if you use a disposable fork). These are an excellent meal by themselves or you can pair them with one of the other recipes below to make it a feast. Make sure you save room for dessert though because I have some killer ones to share below. Who doesn’t love Tex Mex? The best part to this dish is that this dish is not only quick and easy but also very healthy. 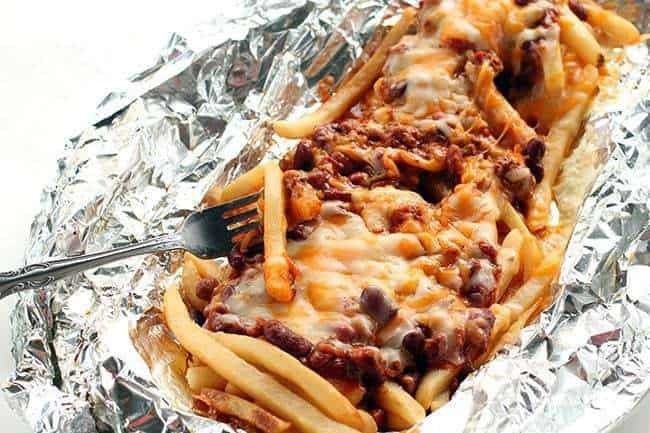 It’s good to have healthy alternatives, otherwise you might be tempted to go the whole weekend eating campfire chili cheese fries (although we’d understand if you tried!). 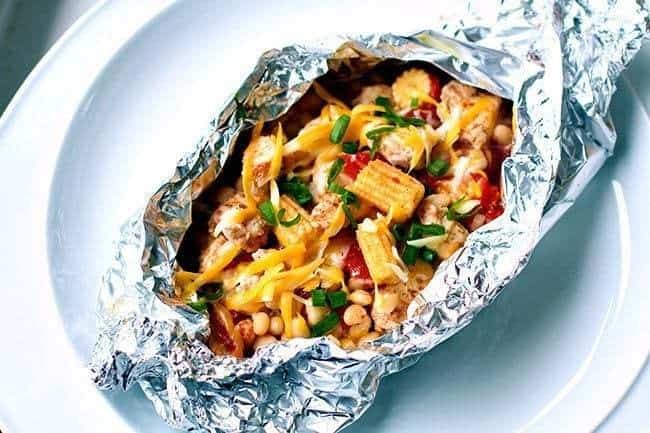 Chicken foil packets are the way to go when camping, keep those dishes to a minimum and enjoy eating this great meal around the campfire. 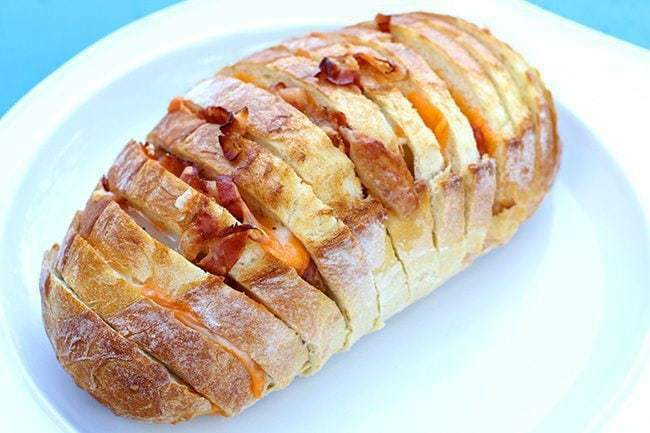 Bread + Bacon + Cheese = Awesome. This is a super simple recipe that requires a nice loaf of your favorite bread and some bacon and cheese. Ingredient wise, it doesn’t get much easier and it’s a very delicious stand alone snack or addition to one of the other meals listed here. We like to use a nice Italian style loaf but you can do this with potato bread, sourdough or anything really. The sky’s the limit. Heck you can even stuff some onion in there if you are so inclined. Give it a try! This recipe was born as a result of a mistake to be perfectly honest, when Karlynn’s Dad brought the wrong kind of frozen hashbrowns camping. The result? A hashbrown crusted breakfast pizza. I know right? The kids, of course, thought this was the greatest thing ever. The title says it all folks, this recipe pretty much screams “eat the whole thing and leave none for the rest of the family”. You can’t go wrong adding bacon to anything really so this just takes it one step further by cramming it into one of my favorite desserts. The only problem with this recipe, is you need more than one skillet because these have a tendency to disappear fast. Prepare to have family and friends hovering over you waiting for them to be done so they can be inhaled. I’d recommend whipping up 2-3 skillets worth depending on how many people you have to feed. 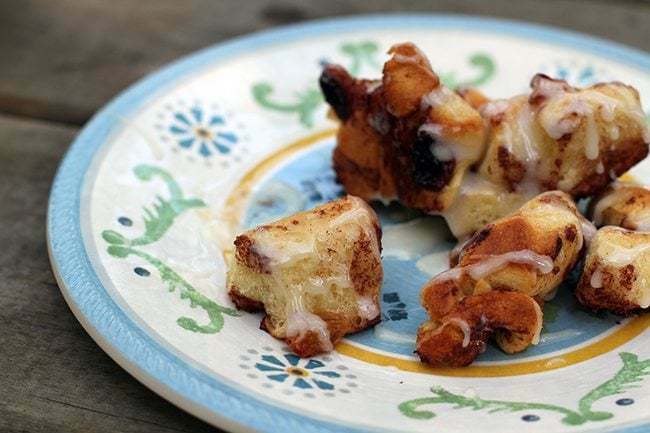 Karlynn’s Monkey Bread recipe is one of her most popular and one of the easiest to make (says the guy who doesn’t have to make it). This takes it one step further and brings it to the campground. The best thing about monkey bread is that it can serve as a great breakfast or something you whip up for a late night snack. Be warned: as soon as this is ready, it’ll be torn into and devoured far faster than you can anticipate so make sure you steal some for yourself before you announce that it’s ready. 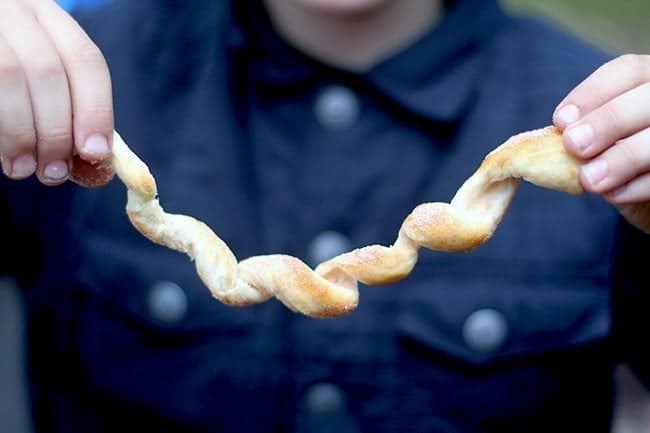 Brown bears are a super simple recipe that people have been making for ages and they are the easiest type of camping recipe, cooked dough on a stick. The best part of these is the number of ways you can mix them up; roll them in cinnamon sugar, dip them in chocolate, the sky is the limit! Finally a recipe I get credit for (sort of). 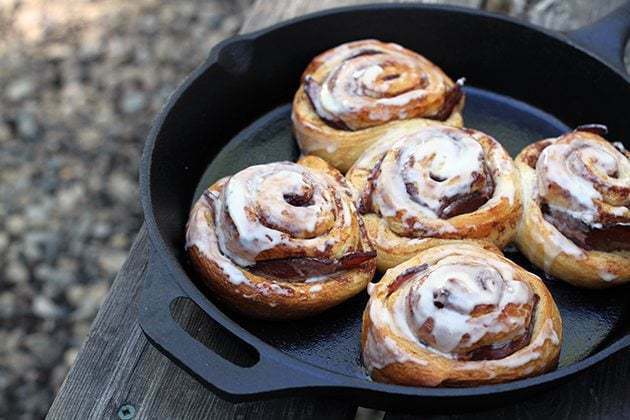 This one came about because Karlynn and I were craving some kind of dessert while camping and all we had in the fridge was a can of large cinnamon rolls. She turned to me and told me to go buy her something she could bake into them, so I chose Turtles. The rest, is history. Obviously, you can whip this up with pretty much anything inside of it, Turtles are simply a suggestion. 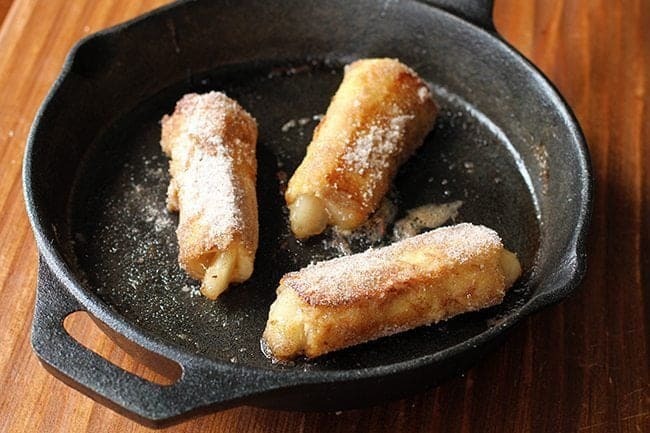 Why stick with just normal french toast when you can roll it up in cinnamon sugar and what goes better with cinnamon sugar than apple pie filling? Yes, they taste as good as they look. You can also, of course, mix things up and swap out the filling with pretty much anything you want. 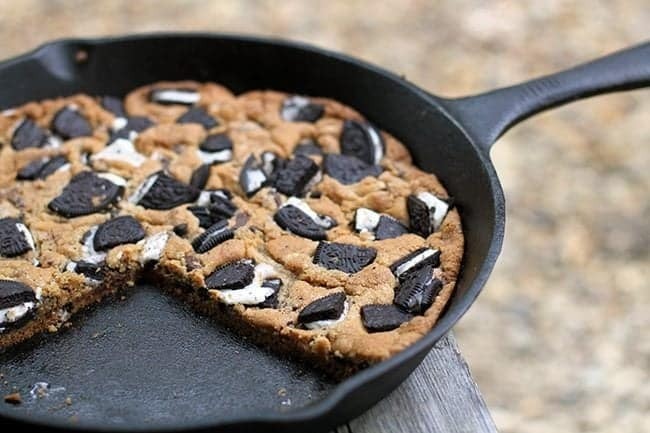 This is a giggle-inducing camping recipe, my friends, because it’s quick, it’s easy and it’s a giant cookie in a skillet. Period. I have to admit that we’ve made this one far too frequently as it’s just so simple with only two ingredients needed: Pillsbury cookie dough and a bag of Oreo’s. And there you have it folks! 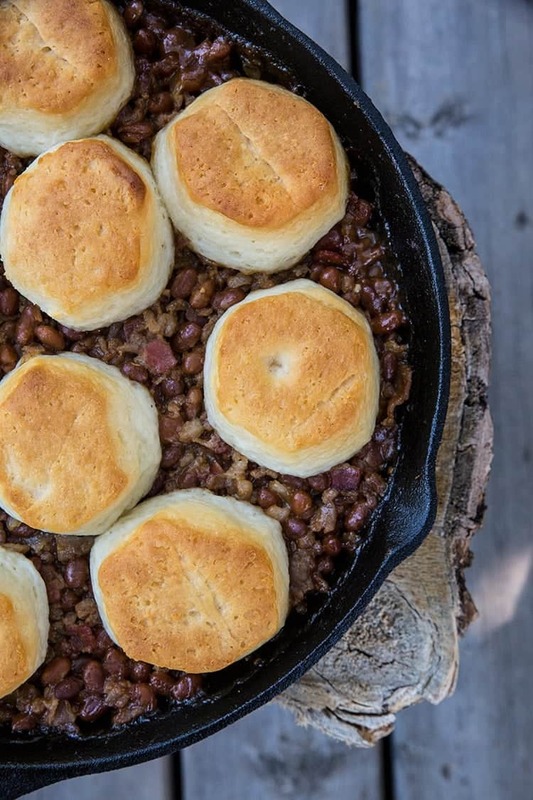 11 Quick and easy camping recipes to make you the hit of the campground. Be careful that you don’t let your neighbors see what you’re making or you won’t be able to get rid of them the whole weekend. Pin this post to your CAMPING Board and remember to FOLLOW ME ON PINTEREST! Do you have any favorite camping recipes you’d like to share? Leave them in the comments below, I’d love to hear some of your ideas. The Top 10 Dinner Recipes of 2018! As I scroll down, the things are getting better and better …… great post. Thank you !